As is often the case, I discovered Chinese Laundry through the impossibly styled, polished, saturated pictures of Instagram. Seen through colourful filters, these small tables crammed with perfectly arranged plates, and just the right amount of movement (a manicured hand holding chopsticks; a cardigan-wearing arm reaching for some bread), are somehow capable of giving you food envy and a start of salivation. Yet, by definition, this medium cannot convey in any way the flavour of a dish, its aroma, the warm feeling in your mouth and belly, its texture. Then why am I so attracted to these pictures, why do I follow these as if they were recommendation from a favourite kitchen critic? Maybe there is an element of shameless shallowness, of searching the aesthetically pleasing, of wanting to eat photogenic food. Time Out rushes in defence of brown food; and while I agree with the argument (a curry will never look particularly photogenic, unless you pile edible flowers on it; and as far as the rainbow cake/bagel/soup trend goes, if you’re eating something of a hue that does not even exist in nature, you probably need a cup of green tea), I think there is more to a picture of food. If you know food even a little, if you love it, a photo will be enough to decide whether the tomatoes are ripe, whether the mango was stringy, if the fried batter is soggy or impossibly crisp. There is a lot you can tell from a bidimensional picture, even if its colours are artificially enhanced. In the case of Chinese laundry, pictures of geometrical dumpling omelettes, and sides of pale milky buns, trickling onto my Instagram feed, looked spanking fresh, and astonishingly not swimming in oil. Things that the beautiful photos did not manage to convey: flavour. Buckets of flavours. Chinese Laundry is a small, narrow restaurant with adorable dusty green walls adorned with retro Chinese prints – the idea behind the restaurant is to recreate the 80’s in China. The decor, as well as quirky, has a warm, homely feel to it. 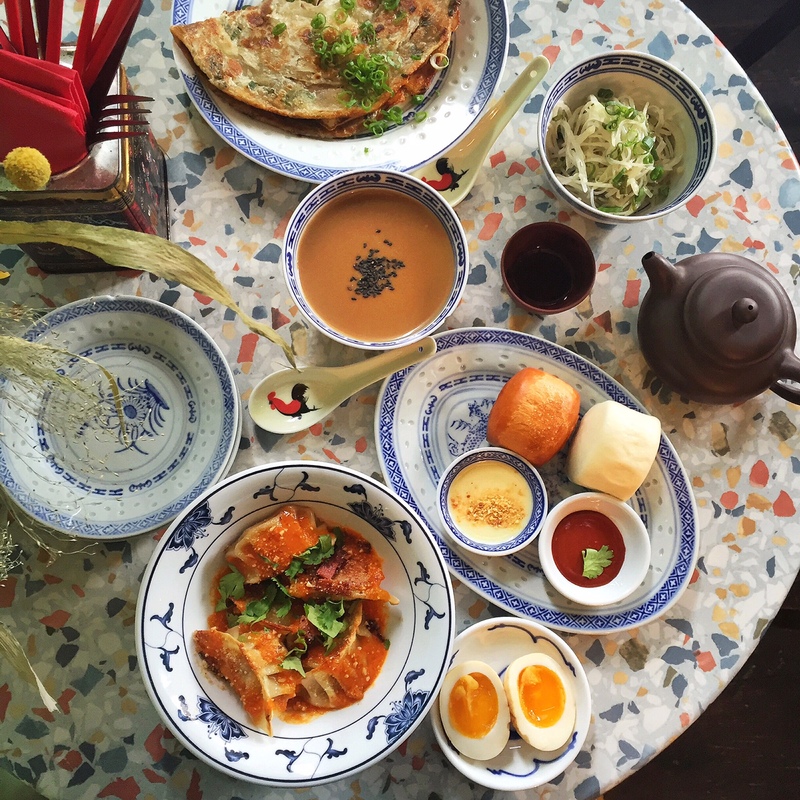 Served in immaculate white-and-blue porcelain, breakfast was wonderfully crafted: a crispy scallion pancake with egg and bacon to binge on, aromatic teas served in small matte teapots, bright-yolked soft boiled tea eggs, their back decorated by mesmerising patterns; a fiery, comforting dish of stir fry dumplings. The side of little milky buns –something extremely pleasing in the consonance of coronals – features one of my absolute favourite foods of all times, for no particular reasons: mantou, the softest, chewiest, palest bun, in two versions: a plain steamed bun served with a sharp, almost sour spicy sauce, and a golden version, I can only assumed deep fried, accompanied by condensed milk spiked with peanuts and toasted sesame. I went again for dinner, this time a slightly less photogenic one due to dim lighting, and loved the food nonetheless. The plates are fairly small but not quite as small as they make them to be – two plates with some rice and of course mantou, still warm in its wooden basket, were quite filling. The sweet basil pop corn chicken, fried to perfection, meat soft and supple and a crispy batter laced with aromatic sweet basil, was the sort of dish that you could find yourself craving at all times of the night and day. 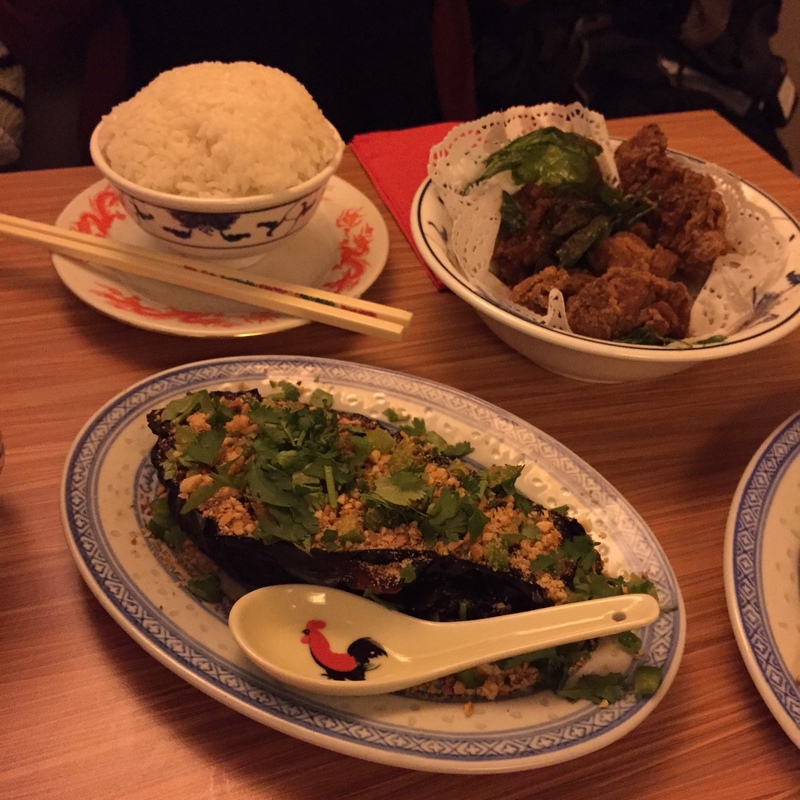 The aubergine, which always deserves love, was grilled until its pulp was almost creamy, with slight sour notes, and topped with chopped peppers and peanuts for texture, its subtle smokiness perfect on steamed white rice. Other dishes I stole bites from included cumin-rich lamb skewers, soft and juicy; aubergine with hot smoked salmon; crispy silken tofu; a delightful and refreshing starter of courgette with raspberry, all with incredibly friendly service – when our waiter was telling us of the town in China he went to college to, I didn’t ever want to leave. So yes, I suppose Instagram may only tell you so much – but when it gets it right, boy, does it get it right.